The Australian Transportation Safety Bureau (ATSB) has released a preliminary report into structural damage suffered by a Virgin Australia ATR 72 on a flight from Canberra to Sydney on February 20. The aircraft – registered VH-FVR – was operating a RPT service into Sydney when the crew experienced a possible over speed event while on descent which resulted in a pitch-disconnect of the horizontal stabiliser and differential control inputs from the operating flightcrew. Upon landing in Sydney, the aircraft was grounded for inspection which was carried out by torchlight at night, but no trace of any structural damage was found. On February 25 – after the aircraft had flown 13 more sectors – the pilot reported a possible bird strike while on descent into Albury, and ordered an inspection of the aircraft upon landing. During this inspection damage to the horizontal and vertical stabiliser fairing was noted, and a subsequent inspection linked the damage to the February 20 differential control event. 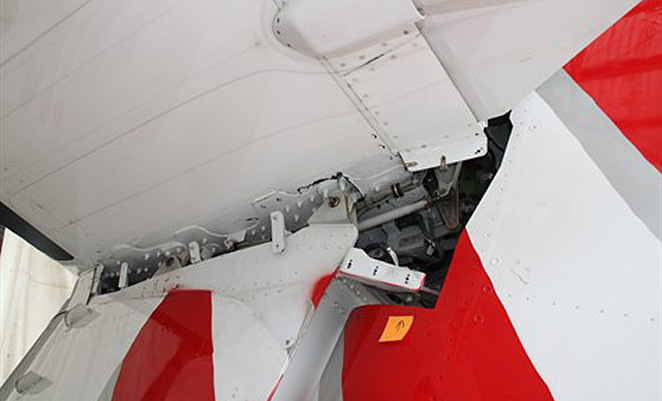 ATR engineers inspected the aircraft and found broken carbon plies, cracked joint sealant, deformations, and minor damage to the rudder, all of which it said were consistent with an overstress condition, and recommended replacement of the horizontal stabiliser, elevators, and vertical stabiliser. It does make you wonder what could have ultimately happened had the bird strike/possible bird strike not occurred. Where is the regulator? A thorough inspection is required of VA maintenance procedures and appropriate action needs to be taken. This is really quite unacceptable. I feel that if the original Pilots had provided the Engineers with more details of the extent of the original incident, when they wrote the inicident in the tech log, then perhaps the Engineers would have conducted a more thorough inspection at that time, and removed some of the fairings for inspection. It is interesting to note that the second inspection was more thorough than the first, and uncovered the damage, and yet the events leading to the inspections,were more severe in the first incident? This is quite disturbing given that the pilots had made admissions as to the original incident that was inspected, missed and then reinspected for at least one or two more “Daily” inspections and walk arounds.. VB allows pilots to conduct Daily Inspections, but would having an engineer perform these checks make any difference if the original incident was missed..? This is more than just a close call, several steps that should have found this obvious damage have failed to work, the system and proceedures require fairly urgent attention to avoid any repeat. I have to wonder if there was there an actual bird strike? Did the crew sight a bird or just hear a unexplained thud or control deflection? The report states the flight crew saw a flock of birds on finals and the pitch control didn’t feel right, so they thought they may have had a bird strike. No evidence of a bird strike was found. The full report is available on the ATSB website. In my time, when an overspeed or overstress of any kind was reported or suspected, that aircraft would have been grounded until a full and even intrusive inspection had been carried out. This often involved putting the aircraft into jigs and checking for distorsions and alignments, control “rigging” and defection parameters. Time spent on the ground on maintenance saves lives in the air. The differential control input problem should have been enough to justify a much closer inspection rather than just a torch light inspection at night on the tarmac. Primary flight control problems should automatically be dealt with in a way that does not release the aircraft for further operations until there’s a positive resolution to the problem. I totally agree with most of the above statements, it’s criminal in my estimation, that pilots had made admissions to the original incident, was inspected and missed, then re-inspected on TWO more Daily Inspections, and walk arounds. Any differential / primary flight controls should warrant IMMEDIATE ATTENTION. This could easily, but for the Grace of God, meant the loss of many lives. I don’t wish to sound facetious, but the statement in regard to ‘grounding’ the aircraft, means loss of revenue in the airline business, it appears crew and pax lives are of less importance. Guess what? All missed by the pilot during their walk around. I shudder to think as to who will pay the ultimate price, certainly not the policy makers, managers or the spin cycle clowns. And what more to all you pilots out there, get a real GOOD torch and have a bloody good look, your backside is on the line too you know. A mobile phone torch is a JOKE! Get a good quality LED torch, it might just save your life. Luckily, I am out of the industry, I feel sorry for all the great young blokes I helped train. If they can keep their job they will be sorely tested. Every day I thank my luck stars that I am out of the industry, although now days when I hear a plane going over, I’m looking to see where it might land! Agree with you fully Geoff, while I can understand the concept behind maintenance on demand, and that in the past there have been too many engineers on the ramp, doing jobs that can be done by ramp staff, eg push back. However i find it staggering that fully trained engineers, now sit in an office at the airport, and do not go near an aircraft unless they are called to attend, as a result of a problem with a particular aircraft. These highly skilled people should be out on the line, doing a walk around for every turn around! I have also known of instances when the Engineer has picked up issues on his walk around missed by the Pilot! This situation is not good. As a former FA on Ansett, it concerns me that this has happened. The high standards of yester year are long gone. The ATR 72 has not had a good record for safety overseas and seems it’s our turn here in Australia. I won’t fly on this type ever again. The FA’s that fligh on these aircraft should be very concerned. The incident in question was a direct result of an overspeed situation resulting in damage which was missed on an inspection, and is likely not attributable to the aircraft in anyway. Before we all get into a lather about who does walkarounds, I have had ramp staff pick up issues missed by an engineer…. If the proper procedure as laid down was followed then we wait until the investigation is complete and see what we can learn from it. That’s what aviation professional do. If anything this has demonstrated the resilience of modern aircraft design. Did the pilot entry in the aircraft log mention pitch disconnect due to moderate turbulence ? That would explain why engineers were mislead. Exceed by error, report honestly, be sacked.